House Speaker Dennis Hastert has joined the White House and Democratic congressional leaders in calling for a criminal probe into former Congressman Mark Foley's sexually suggestive electronic messages to teenage boys. Hastert has written Attorney General Alberto Gonzales to request a Justice Department investigation of the case. "While the House of Representatives on that day voted to refer this matter to the Committee on Standards of Official Conduct for investigation, they do not have jurisdiction over federal law or over him upon his resignation from office," the letter reads. 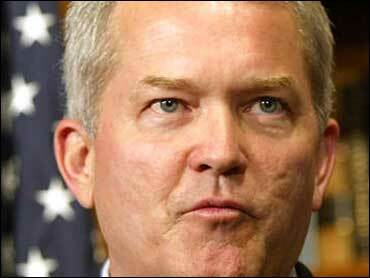 The FBI is examining former Congressman Mark Foley's e-mail exchanges with teenagers to determine if they violated federal law, an agency spokesman said. FBI spokesman Richard Kolko said Sunday the FBI is "conducting an assessment to see if there's been a violation of federal law." Senate Democratic Leader Harry Reid has raised the possibility that House Republican leaders "knew there was a problem and ignored it to preserve a congressional seat this election year." House Democratic leader Nancy Pelosi is demanding to know whether Foley had other contacts with House pages and when the Republican leadership was notified of Foley's conduct. "This should be investigated objectively. I think the Democratic leadership should have been told 10 months ago," said Rep. Jane Harman of California, top Democrat on the House Intelligence Committee. "I gather that basically nothing was done except that Foley was warned." Foley, R-Fla., quit Congress on Friday after the disclosure of the e-mails to a teenage boy who was a former congressional page and the lawmaker's sexually suggestive instant messages to other pages. White House aide Dan Bartlett said the allegations against Foley were shocking and that President Bush had not been informed previously about the e-mails. Bartlett said there was no need for an independent outside investigation. "There is going to be, I'm sure, a criminal investigation into the particulars of this case," he said. "We need to make sure that the page system is one in which children come up here and can work and make sure that they are protected." Hastert, R-Ill., said at first he had learned only last week about the e-mails Foley sent to a page. Hastert later acknowledged that aides referred the matter to the authorities last fall. Hastert's office said, however, it was only aware the e-mails were "over-friendly," and asked for a review by the House board that oversees pages late last year. Hastert, Boehner and Majority Whip Roy Blunt, R-Mo., said in a joint statement Saturday that "the improper communications between Congressman Mark Foley and former House congressional pages is unacceptable and abhorrent. It is an obscene breach of trust." Foley, who is 52 and single, was co-chairman of the Congressional Missing and Exploited Children's Caucus. In a statement released by his office Friday, the lawmaker said, "I am deeply sorry and I apologize for letting down my family and the people of Florida I have had the privilege to represent." The House voted Friday to refer the matter for investigation by the House ethics committee. Democrats said Sunday any investigation must be thorough, but completed quickly. "I am not comfortable with where we're leaving this. It's not my call what we do next, but more needs to be done," Harman said. "There's been a Republican investigation for 24 hours of Republican activity, I just don't think that that is adequate." Rep. John Murtha, D-Pa., faulted the House GOP leadership for not acting sooner. "It's outrageous," he said, citing reports indicating they were told months ago. "We have an obligation to protect these young pages. ... It really makes me nervous that they might have tried to cover this up." He called for a quick investigation before the November elections to "hold people accountable," but said there was no need for an outside investigation. "I think it's something the ethics committee can handle. ... It's something that can be handled internally." Rep. Thomas Reynolds, head of the House Republican election effort, said Saturday he told Hastert months ago about concerns Foley sent inappropriate messages to a teenage boy. Reynolds, R-N.Y., is under attack from Democrats who say he did too little to protect the boy. Republican leaders say it's their duty to ensure House pages' safety, and are now creating a toll-free hot line for pages and their families to call to confidentially report any incidents. They also will consider adopting new rules on communications between lawmakers and pages. The Republican rank and file called for any leaders with knowledge of the e-mails to be held accountable. "Anyone who was involved in the chain of information should come forward and tell when they were told, what they were told and what they did with the information when they got it," Rep. Peter King of New York told the New York Times. King added that it was a "dark day" for Congress. Rep. Christopher Shays of Connecticut, said "If they knew or should have known the extent of this problem, they should not serve in leadership," Mr. Shays told the Times. The boy who received the e-mails was 16 in the summer of 2005 when he was a House page. After his return home to Louisiana, Foley e-mailed him and asked for a picture. That request was "sick" and "freaked me out," the boy said in an e-mail to a colleague in the office of Rep. Rodney Alexander, R-La., who had sponsored the boy in the House. Harman was on "Fox News Sunday," while Bartlett and Murtha appeared on ABC's "This Week."